The other day I got the latest issue of the Swedish survival magazine Överleva (Survive) offered by The Swedish Survival Guild. An interesting mag with a lot of nice reading on bushcraft and survival in the outdoors. It's an honor for me that The Guild also decided to do a piece on me and my Jonas Vildmark's Method for Survival Training (JVMS). You can read about my plans for this summer's adventure "JVMS 6, 60, 60 - Midsummer Survival". Thanks for an inspirational magazine. When I'm heading out for a couple of days I usually bring what I call a Weekendpack; a backpack holding around 70 liters. 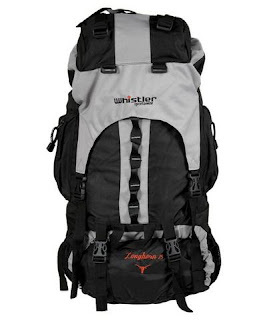 Osprey Aether 70 falls into this category nicely. I've been using the Aether 70 for some months now and I'm very pleased with it. My erlyer experiences with Osprey's products has been with the Poco Premium Child Carrier which has given me many inspiring kilometers in the great outdoors. The Aether 70's carry system consists of a light weight frame with robust, comfortable and easy to adjust harness and hip belt. You can't adjust the carry system in relation to the sack. Instead Osprey offer the backpacks in different sizes. The Aether series is offered in three different models (60, 70 and 85) and these you can get in four different sizes (S, M, L and XL) to fit our different backs. My tips to you is to try out your backpack for a perfect fit. The carry system's effective hip belt is equipped with two smaller zipper pockets for stuff like keys, cellphone and compact camera. The shape of the belt is possible to reshape, using a heat oven at your dealer's, for a custom fit. Personally I haven't done this as I like the original fit. Between the carry system and the sack a pocket is situated for mounting a hydration system (optional). The Aether's biggest compartment is accessed through three different pockets; the main top opening and two access zippers. I really like the big zipper that allows easy acces to all the gear inside the main compartment. When needed you can divide the main compartment into two compartments allowing you to perhaps store your sleeping bag in the lover compartment. On the outside of the bag you have elastic pockets without zippers for stowing for instance sandals, rain jacket and water bottle. The top lid of the pack can be removed and used as a hip bag offering two zipper pockets. The Aether 70 is equipped with effective compression straps for jarning down on the filled pack or just making it smaller in situations when you don't need all the 70 liters. Outside the pack you also find several smart attachment possibilitys for gear like sleeping roll, ice hatchets, sled, ski poles and add-on bags. Aether 70 is offered in three different colors and in Europe the bag comes with a removable rain cover. 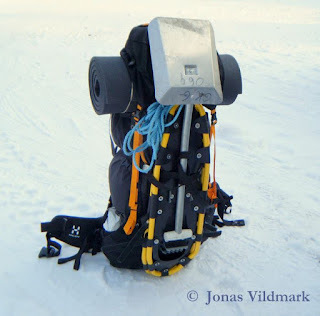 throughout the years, you can read about some of them here on Jonas Vildmark, but now my favorite in this category is the Osprey Aether 70. Looking forward to further adventures together with my Aether and getting back to this post for updates. Also check out my Advice on Gear. 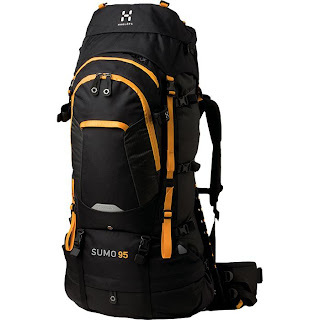 One of my bigger backpacks I've been using is the Sumo 95 from the Swedish Company Haglöfs. This pack has been Haglöfs biggest expedition backpack for some years but is now replaced by LEX 80 and LEX 110. Sumo 95 is a robust bag with clever solutions, like for instance the top lid that can be removed and used as a sepate hip bag. 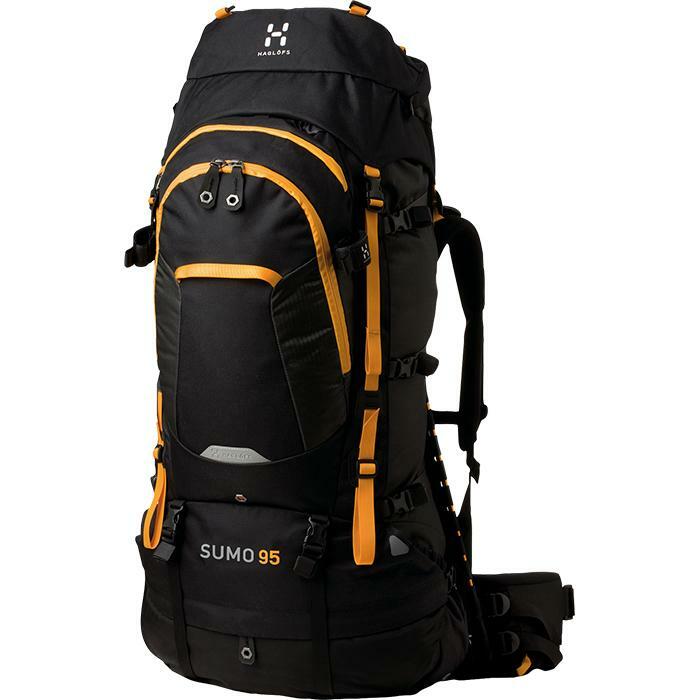 Sumo 95 have a high profiled shape and is equipped with a strong and comfortable carry system, this product is made for heavy loads. After a couple of months of useage Haglöfs contacted me and advised me to return the pack cause they had detected a quality issue on some of the Sumos. Although my bag hadn't shown Any signs of failor, I took the offer and sent Haglöfs my Sumo 95. The Company stood for the costs and returned my backpack after additional sewing had been done to strengthen the weight distribution system called Spear. There's always sad when quality campaigns is needed, but my hat off Haglöfs for a well executed campaign. I have used this Sumo 95 for some years now and I'm very pleased with it. This is a big and robust pack but once fitted on the back it feels slim. I've heard some complains on the height of the pack and the risk of bumping the back of your head into the bag while hiking, but this is nothing I've experienced. I like the good quality, the easy to reach pockets and the nice carry system's high capacity. Below you can see a more detailed technical specification that I borrowed from my friends at Tradeinn. - Carrying handles on front- and backside. C (-4°F). The shoes gets the job done quite well, especially regarding their low price. 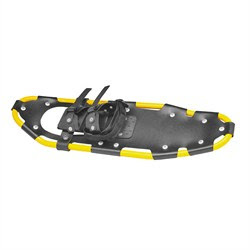 The full-rotation bindings holds the shoes nicely in place and allows the heal to lift from the frame in each step. This combined with good spikes underneath the frame gives a comfortable walk. Unfortunately I've noticed a small crack on one of the binding's plastic locks. Let's hope it doesn't brake.With the right conditions snowshoe walking is really a great way of exploring the lovely winter landscape. 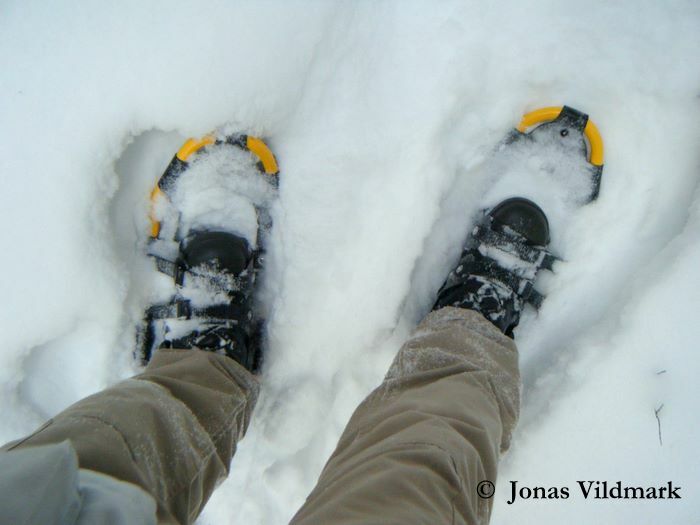 During winter hikes I keep the snowshoes strapped on my backpack within easy reach to facilitate a pleasant adventure. Today Jula no longer have this exact product in stock. Instead they offer the Kayoba Snowshoe. After a good night's sleep on the back of my pickup truck by the lake Vättern it's time to take on the Elmia Game Fair 2013. This is my first time here and I'm expecting a nice mixture of happy faces, interesting lectures and inspiring gear. My old Primus stove has just filled my bottle with hot coffee and my comfy shoes are on, so let's do this! Besides dog shows, test shooting, trick shoot shows and great fishing stories the exhibition also offer a number of interesting presentations regarding hunting; Mikael Tham talked about the growing Swedish Wild boar population. He stressed the importance of well organised hunting communities to maintain the wild life balance. Mikael made comparisons with Germany and their problems with their large wild boar population. Thomas Ekberg tyred looking into the future and talked about what he wish for in tomorrow's hunting. Unfortunately Thomas was worried that the infected debate on wolfs in Sweden is jeopardizing a creative and reasonable balance between Man and Predator in the countryside. Thomas hoped for a cooperation between hunting unions to spread correct information. This could help give a more balanced picture of the predators to the politicians and the media. Rasmus Boström sheared his experience in bear hunting. A couple of his tips was to be a flexible hunter and keep your gun and shooting skills in shape, cos bear hunting is action hunting! Some other highlights on the fair was; Promoteq showing their new first aid kit for hunters, flash lights from Fenix and some new stuff from Benchmade. Karesuandokniven told me about their new projects. Wetterlings had brought their nice axes to the exhibition. Always nice to visit Mora of Sweden's stand. At Fondprodukter's stand I found some interesting news from Buck, and Stabilotherm AB offered a nice chat about their nice blades. As you know I'm an edge lover so I hope I'll be able to get back to you regarding the above products for some testing and reviews later on here on Jonas Vildmark's Knives - Tools & Art. Elmia Game Fair 2013 was a really nice event. I got to meet some good old friends and I also found some new acquaintances. I hope you got just as inspired as me now looking forward to the upcoming hunting season and outdoor adventures. Whistler Longhorn 75 is a mid size Canadian backpack made of Polyester. 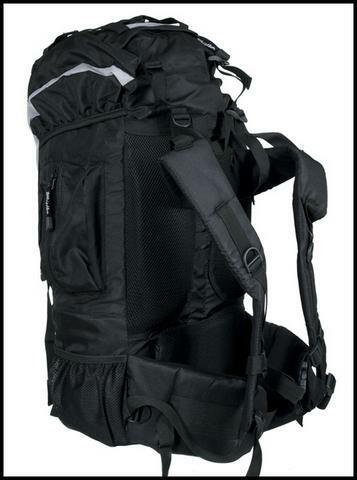 The pack has a adjustable carry system that's very soft and works OK with lighter loads. Good quality zippers from YKK manages the practical situated pockets. I miss some compression straps to tighten up the bag when it's not fully loaded. This is an OK backpack for these kind of money but I don't recommend this bag if you're planning on carrying a heavy load. I've used the Longhorn 75 for some years now and the repairs I've been forced to do is replacing the top closing line and some plastic buckles. 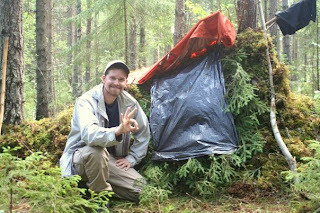 The Swedish Survival Guild (Svenska Överlevnadssällskapet, SÖS) was founded in the early 80's and the organisation's mission is to educate us in the art of bushcraft knowledge and survival. SÖS offers both theoretical and practical knowledge. This gives a great opportunity to test one's limits under safe conditions. It's interesting to see how one reacts in tough situations without food and equipment. During one week me and seven other outdoor enthusiasts participated in SÖS Basic Summer Training. The training was lead by four experienced instructors. One of the instructors who also was a Medical Doctor monitored and documented our physical status. This gave us interesting data regarding starvation and sleep deprivation. As the moment of surprise is a big part of this course I don't wanna revile too much of the contents of this training, but I can say that this week gave me interesting knowledge regarding eatable plants, making fire, water purification, first aid, building shelter, navigation, psychology, signaling, hunting, fishing and much more. This is priceless knowledge for all, and especially for us operating in remote areas. I can recommend you to visit SÖS's website and SÖS's page on Facebook to be inspired and sign up for one of their courses. Here you have some pics from my weekend in the archipelago. I've just started using a new camera, a Olympus TG-2, and feel inspired to approve my photo skills. The archipelago is a fantastic surrounding in which you can get to now your camera and it's ability to capture perspective motives.